Before I forget, this is the last weekend to get yourself a 2018 Christmas Surprise Package. No other sale compares to it! And I continue to load them up and make them awesome. So if you have been meaning to get one, your time is almost up! You have this weekend to order and then it is done and gone till next Christmas. This offer will NOT be extended. 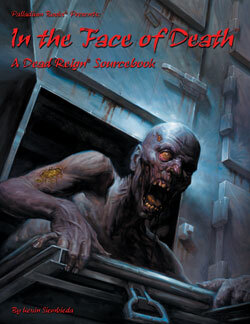 Things have been booming at Palladium Books as we push our production into high gear. When not working on Rifts® Bestiary™, Volume One and Beyond the Supernatural™ books, among others, I have been meeting and talking with freelancers about a large number of book projects. Chuck, Alex and I spent an entire day with freelance writer and game designer Carmen Bellaire discussing the four projects he’ll be contributing to in addition to the one he turned in that morning! I have also spoken on the phone with freelance writers Matthew Clements and Greg Diaczyk and have exchanged emails with other writers and artists. 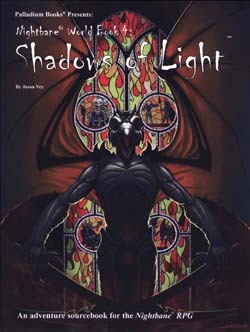 This includes new releases for many game lines with an emphasis on Rifts®, Palladium Fantasy RPG®, Rifts® Chaos Earth®, Heroes Unlimited™ and Beyond the Supernatural™. Also looking hard at releasing two new Raw Preview editions within the next month. Folks enjoy them so we’ll keep them coming. Speaking of which, the Rifts® Antarctica Raw Preview is sold out and there are only 4 copies of the Surviving Chaos™ Raw Preview which presents both Rifts® Chaos Earth® Psychic Scream™ and Rifts® Chaos Earth® First Responders™, combined. Wayne Smith and I have discussed plans for The Rifter® #83 and #84 as well as offering Rifter® Mini-Subscriptions (the standard 4 issue starting with #81, plus a three issue sub, #82, 83, 84, and a two issue subscription for #83 and #84) so that our loyal subscribers can still get the books at the price and convenience they are used to. 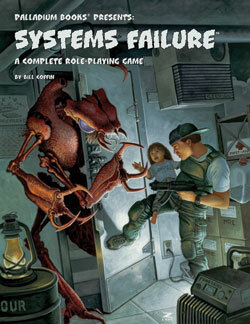 It is also a way for newcomers to try these excellent sourcebooks for these final and recent Rifter® issues. These offers and a Rifter® $9.99 sale should be available as soon as today. 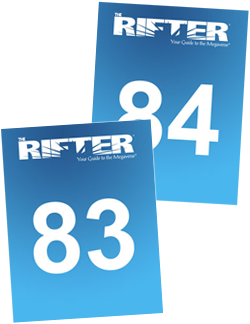 We have gotten a heartfelt outpouring from Rifter® fans about the two year hiatus after #84. Subscribers and fans overwhelmingly understand and support our decision, especially if it means Palladium being able to release more products. Moreover, we encourage gamers and fans to continue to submit Rifter® Submissions for the future. Maybe we’ll use some of those submissions as contributions to actual sourcebooks or put together a special issue of The Rifter®. This is in addition to working on licensing agreements for fun products like litRPG novels for Rifts®, Rifts® iOS digital stickers for Apple cell phones (and maybe other Palladium game lines if these do well), and a maybe even official LARP games and events for Heroes Unlimited™ and Nightbane®, among other things that I cannot yet talk about. 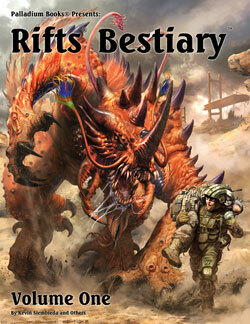 What else is going on ... Rifts® Heroes of Humanity is the new PDF title available on DriveThruRPG and you can expect at least one or two Bundles of Holding offered later in the year as well as other offerings. We’ll also be working more closely with a number of podcasts and YouTube shows. And Alex has added some new original artwork and 20-30 more one-of-a-kind negatives and collectibles to my Ebay store (see details elsewhere in this update). As you can see, 2019 is shaping up to be an exciting year. And that’s just the tip of the iceberg for what we have planned. Keep checking these Weekly Updates for news, information, sales and release dates. The Rifts® Antarctica Raw Preview Edition, limited to 150 copies, is sold out. Thanks to your input about the Raw Preview we have made a number of tweaks, changes and additions that will only make the final sourcebook that much better. 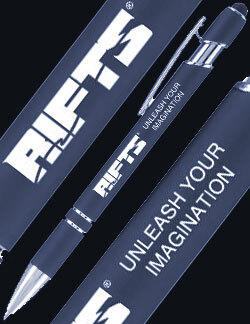 We anticipate Rifts® Antarctica to be a summer release, but a firm release date is not yet established. Yep, if you want to get a sneak peak at the unedited, unfinished manuscripts for Rifts® Chaos Earth®: Psychic Scream and First Responders, you’d better do so soon, because there are only four copies of Surviving Chaos™ Raw Preview Edition available! Limited to 150 copies. Will we do this again next year with these titles? Maybe. What about other out of print books? Again, maybe. This was sort of a fun experiment. An experiment that was quite successful as there are fewer than 12 copies of each of these books currently available and going fast. Get them while you can. 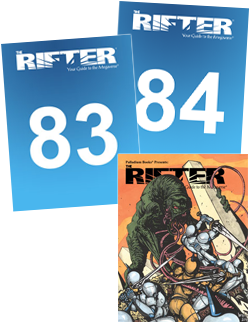 With The Rifter® going on hiatus for at least two years after The Rifter® #83 and #84, and because of a number of inquiries from loyal subscribers, we have decided to offer a trio of subscription opportunities. Each sub provides the same savings off the cover price of each book and FREE shipping to subscribers in the USA only. The idea of a mini-subscription was first suggested by subscriber Doug Lamberson. Later that same day, Palladium order processor Kathy Simmons independently made the same suggestion. Several subscribers have subsequently inquired about the possibility of a “short” subscription, so we figured, why the heck not? We appreciate your loyalty and years of support, so we are happy to offer you these subscription savings and convenience to you. 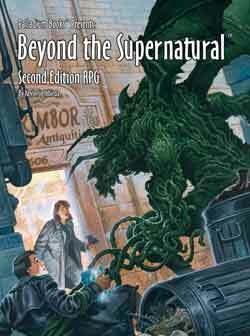 It is also a way for newcomers to try these excellent sourcebooks and gaming tools. 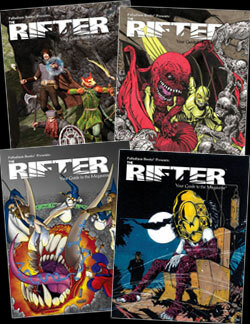 These Rifter® subscription options are all available now. We are also offering a corresponding Rifter® Back Issues Sale, see details below. 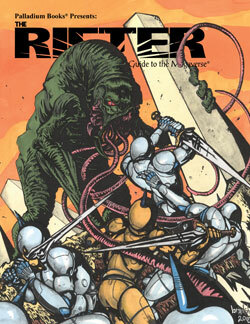 Highly recommended: The Rifter® #82, which is epic. Don’t miss it. Rifts® Chaos Earth® – Pyromancy, Nebraska Part Three – The Pyromancer O.C.C., 50+ Pyromancy spells (new! ), Zone Twister, NPCs and more. “Official” source material. Rifts® Bestiary Sneak Preview – Complete stats for a few choice monsters new and old to give you a taste of what you can expect in Rifts® Bestiary Volume One. “Official” source material. Heroes Unlimited™ – Physical Training heroes revisited with new skills, gadgets and fun. Nightbane® – Age Modifiers and Education rules – “Official” source material.‘Nuff said. Gaming Advice from Erick Wujcik – Thinking Big and The Name Giver, sage advice reprinted from The Rifter® #1 & 2. Erick Wujcik Remembered – 10 years after his death, friends and fans remember this unique individual and his work. Insight to the man and Palladium Books, the company he loved. Written by Kevin Siembieda and many others. 112 pages – Cat. No. 182. Available now. The Rifter® #81, #80, #77 and #75 are other personal favorites, among others. A lot is going on at Palladium to bring you a wealth of new products for role-playing, as well as expanding into new markets in the months ahead. Be excited. We are. But our focus here at the Palladium offices is getting books into your hands. We’ll keep you posted as things progress. Oh, and don’t forget this is your last weekend to get a Surprise Package and check out The Rifter® Sale and mini-subscription offers. Alright, that’s it for now. I need to get back to writing. Keep those imaginations burning bright. C.R. in Greensboro, North Carolina, writes: Love the Megaverse®! Nothing else compares. M.V. in Albany, Oregon, writes, in part: I have played them all... The Grab Bag is a lot of fun. And I really enjoy it every year. I have used it to flesh out my own collection and others who play with me... I look forward to many more years of great games from Palladium as the last 30+ years have been fantastic. Merry Christmas and Happy New Year. P.S. It was great seeing you guys at Gen Con. Looking forward to next year (2019). A.S. in Provo, Utah, writes, in part: I have heard interesting things about Heroes Unlimited and I’d love to give it a try... Thanks for doing this every year. I ordered my first [Surprise Package] a few years ago and now Christmas isn’t complete without a Palladium Grab Bag. W.K. in New York, New York, writes: Trying to complete my collection of Palladium Fantasy books. My time is happily consumed with playing Palladium Fantasy® and Rifts®. R.K. in Sault Saint Marie, Michigan, writes: With this one being my final Grab Bag of the year, I wanted to say thank you for all the great pictures and autographs. A truly Palladium Christmas this year, and many adventures await because of it. D.S. 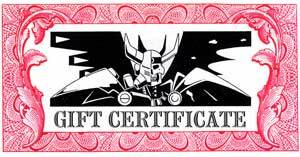 in Amherst, Massachusetts, writes: Love Rifts® and just glad to support you guys! 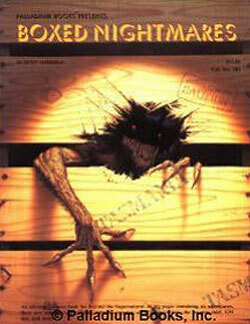 New world books and monsters always welcomed! E.A. in Seattle, Washington, writes: Favorites: Rifts®, Phase World®, Heroes Unlimited™ and Robotech®. Hello and Happy Holidays. This is number 5 on the Grab Bags for this year. You are AWESOME! I have been with you since 1988. Robotech® was my introduction to the joy of role-playing, and then Rifts® crashed into the Megaverse® and gaming exploded in my home! Fellow Service members, family and some college buds, we have all jumped deep into this wonderful [game] system and amazing worlds. Thank you for these memories and the time we spend every Friday night together. D.S. in Maryland Heights, Missouri, writes: So far I have really enjoyed Heroes Unlimited™ and have run several gems with it over the last few years. 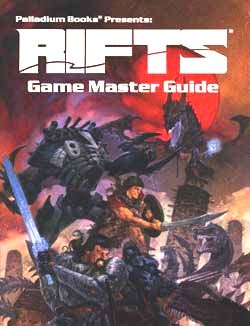 I have been getting into Rifts® Ultimate Edition recently and want to expand my physical collection of books instead of just PDFs. J.A. 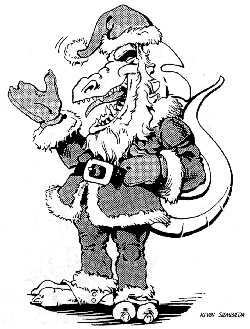 in Ashland, Missouri, writes: Hey folks, wishing you all the very best for the holidays! Thanks for all the great times playing in your worlds. K.L. in Chatsworth, California, writes: I’ve loved Rifts® and Palladium’s games for almost 20 years and I’ll be introducing a new group of friends to them soon. S.F. in Augusta, Maine, writes: This will be the 4th time I’ve been surprised by this gift by my family. I LOVE IT! Thanks for continuing to do this promotion and thanks again for making great products to read and play.